Whether we're shooting with CCDs or "old-fashioned" film cameras, at the business end of any astroimaging setup, we have certain fundamental needs. We need to be able to aim at a target that is often invisible in the camera's viewfinder. We need to easily switch from looking at an abject to imaging it while keeping it accurately positioned in the field of view. If we are making guided exposures, we need a versatile and near-foolproof arrangement for acquiring suitable guide stars. And what about getting all the light our telescope gathers onto the film or CCD? We certainly need that. Finally, today many of us need a set up that allows using film, video, and CCD cameras with equal ease. 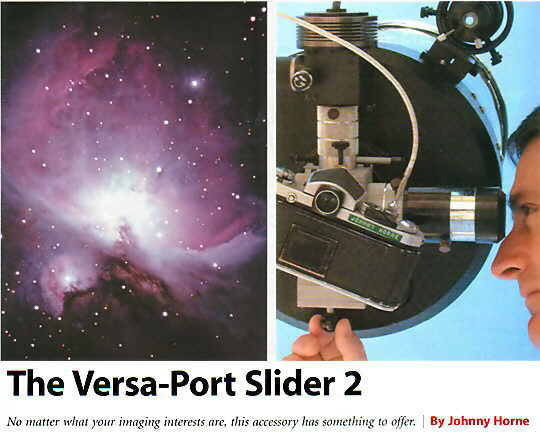 The Versa-Port Slider 2 from Van Slyke Engineering may come closer to meeting this list of needs than any other single accessory on the market. Placed between a telescope and your camera of choice, the Slider offers rugged versatility and positive adjustments, making it a central accessory for a wide range of astroimaging applications. It does the work of a conventional flip-mirror viewer, off-axis guider, and filter holder, all rolled into one unit. I tested a unit that the manufacturer loaned to Sky & Telescope for evaluation. The Slider's body is beautifully machined from a solid block of aluminum. Its outer surfaces have a bead-blasted satin finish that will wear well with heavy use. With 1/4-inch-thick walls, the Slider is robust for sure but not exceptionally heavy. It tips the scales at a manageable 1.9 pounds (0.85 kilograms) without camera adapters or eyepieces attached. Deeply knurled surfaces on the ports for viewing and guiding eyepieces provide a positive grip while adding to the device's appearance. The Slider attaches directly to the threaded ring on the back of all 8-inch Celestron and Meade Schmidt-Cassegrain telescopes, and there is an optional adapter ($49) that allows you to insert it into any 2-inch focuser. Both eyepiece ports on the Slider have a pair of thumbscrews set at right angles to one another to positively secure whatever is inserted into them. The Slider is a handsome piece of work, and if my name were Paul Van Slyke and I had created it, I too would have personally engraved my name on it. The Slider derives its name from the sliding motion required to introduce a mirror that diverts the telescope's light path from a camera to a viewing eyepiece. Similar accessories on the market typically use a mirror on a hinged support that flips up and down. Instead, the Slider's 2 1/4-by-1 3/4-inch mirror is seated in a milled 1/2-inch-thick aluminum cell attached to a plunger. The mirror slides from one end of the device to the other with a 1 3/4-inch-long stroke of the plunger. This arrangement gives the Slider a narrower profile than would be required for a flip mirror. Pushing the plunger in directs the telescope's light to a port on the "top" of the Slider. Since this port accepts 2-inch eyepieces (or 1 1/4-inch models with a $19 adapter), the Slider is effectively a very nice 2-inch star diagonal. The Slider works best with Schmidt-Cassegrains, Maksutov-Cassegrains, and refractors. While its 3 1/2-inch-deep profile is quite compact, most Newtonian reflectors optimized for photography do not have enough focuser "in" travel to allow a conventional camera attached to the Slider to reach focus. I used the Slider to make long-exposure photographs of deep-sky objects with my 11-inch Celestron Schmidt-Cassegrain telescope. Since off-axis guiding long exposures is especially demanding this was an excellent test of the Slider's full range of features. I also used the Slider for high-magnification video imaging of the planets with my observatory's 12 1/2-inch classical Cassegrain reflector. When the Slider is configured for imaging, the telescope's focus is dictated by the position of the camera. To have eyepieces or a CCD guider reach focus at either of the Slider's ports may require extension tubes. Thus, one investment Slider owners will likely want to make is the purchase of optional extension tubes (Van Slyke Engineering offers package deals for some of the more popular combinations). These will save time, especially if you use the Slider in serveral different imaging configurations. To Achieve proper focus at the side ports, you move the eyepiece or CCD guider back and forth in its holder and lock it in place with thumbscrews. Van Slyke Engineering also sells an optional helical focuser ($99), as well as focusing index rings (priced from $12.50), which can be locked on to eyepieces and guiders so that they can be removed and replaced in the side ports without losing focus. The eyepiece holder for the viewing port is literally adjustable, but the Slider loaned to Sky & Telescope for this review was shipped with the holder already accurately aligned with the camera port. I could frame an object in the viewing eyepiece and then retract the mirror knowing with confidence that the object would be perfectly centered in the camera's field of view. My SBIG ST-4 autoguider is fitted with a now-discontinued Flipmate viewing accessory. As such, the CCD chip is farther back from the autoguider's nosepiece than the original configuration. In order to have my ST-4 reach focus on the Slider's guiding port, I had to add several extension rings to the body of my Nikon 35-millimeter camera to mount it farther back from the Slider. The Slider has a spring-loaded filter compartment on the camera port. The spring loading is a nice feature, since it prevents a filter from shifting during an exposure, which could cause the image to shift and ruin the picture. Because the filter is mounted at the camera port, only light destined for the film passes through the filter; light directed to the viewing and guiding ports is not affected. The filter holder accepts standard 48-mm filters. There is an aluminum ring that slips into the holder when no filter is used to prevent stray light from entering the system. Another nice feature of the Slider's design is that you can insert and remove a filter using just one hand. The Slider is well sealed and baffled against stray light. No extraneous light entered the system during any of my dozen or so test exposures. 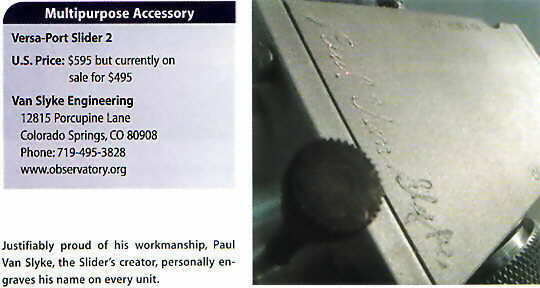 It was not necessary to use a light-tight cap on the viewing eyepiece when I was exposing film at the imaging port. I found the guiding port to be the Slider's most impressive engineering accomplishment. A 3/4-inch "pick-off" mirror directs starlight from the periphery of the telescope's field to a guiding eyepiece or CCD autoguider. This mirror can be steered to scan a relatively wide area for suitable guide stars. As anyone who has used an off-axis guider knows, locating a suitable guide star can be especially frustrating. Because the Slider's pick-off mirror covered such a wide area without me having to rotate the guider around the scope's optical axis, I was able to locate guide stars more easily and faster than with any of the five off-axis guiders I have used in the past. The pick-off mirror's search motions are so far ranging that it is sometimes possible to view your imaging target in the guiding eyepiece. While the pick-off mirror's range of motion is impressive, its locking feature equally impressed me. There are very effective locking thumbscrews on the mirror's two axes of motion. Furthermore, there was no shifting of the guide-star image as I gently tightened the locking screws after centering the star. Despite the relatively large size of the pick-off mirror, I found that it shadowed the frame of a 35-mm camera less than smaller mirrors and prisms in other guiders I have used. The amount of shadowing depends on where the mirror is positioned relative to the periphery of the camera's rectangular frame, but even when the mirror was positioned at a corner the shadowing was very slight. the camera can be rotated independently around the optical axis, so you can place the pick-off mirror's shadow in the least conspicuous part of the image. The Slider's clear aperture from telescope port to camera port is 1 3/4 inches (45mm). This means the most restrictive part of the optical path is likely to be the T-ring that couples a 35-mm camera body to the Slider. Furthermore, some telescopes aren't capable of producing uniform illumination across a 35-mm frame, even without the introduction of an off-axis guider like the Slider. There are no dedicated focal reducers or tele-extenders sold as Slider accessories, but the unit worked fine with standard f/6.3 focal reducers made by Celestron and Meade for their Schmidt-Cassegrain telescopes. Aside from optional extension tubes and focusing indexing collars for your particular setup, the Slider needs no additional hardware. 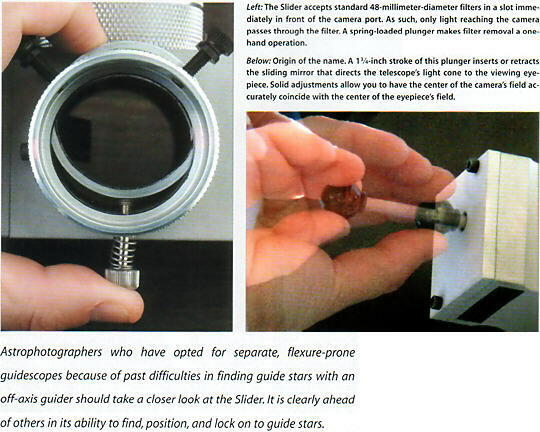 Astrophotographers who have opted for separate, flexure-prone guide scopes because of past difficulties in finding guide stars with an off-axis guider should take a closer look at the Slider. It is clearly ahead of others in its ability to find, position, and lock on to guide stars. While the Slider is more expensive than other off-axis guiders, it is a built-to-last accessory. Since it serves as an off-axis guider, 2-inch star diagonal, and filter holder for film, video, and CCD cameras, the Slider covers a lot of bases. And if you do your sky shooting with a group of astrophotographers, don't plan to pack up the Slider when dawn brightens the eastern sky - come sunrise you're sure to have others wanting to check out the Slider's features and craftsmanship. Contributing editor Johnny Horne is a newpaper photo editor in North Carolina. He can count in decades the time he has spent wrestling with off-axis guiders in the pursuit of deep-sky photography.